Setting up a planted tropical aquarium. eRodent > Tropical Aquarium > Setting Up the Aquarium. These new pages will be about the trials and tribulations of a complete novice (i.e. me) trying to set up a beautiful planted aquarium from scratch. There's lots of books and sites out there on setting up tropical aquariums so I'm not going to try and reproduce this information - simply write about my experiences. I've been feeling quite low lately and the idea of this is to give me a new hobby which I can amuse myself with in the dark evenings - I'm a little bit worried that I have simply given myself a world of hassle but we will see. This is a hobby that can seriously dent your wallet; it's not just the cost of the tank, the small stuff all mounts up. 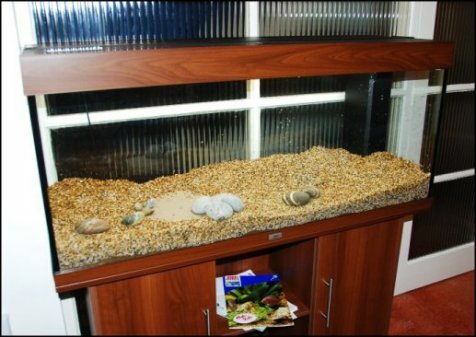 If you are clever and get on eBay you can save a fortune by finding someone who has spent this sort of money and then got bored, flogging the stuff of for a couple of hundred spondoolies.Or you can buy yourself a big heap-o-trouble - see the Before you buy a Tropical Aquarium. page for more on this. When I started out what I was planning to do was buy a 2 foot aquarium for a hundred quid or so, put an 'ironic' castle decoration in it and have a small shoal of neon tetras. Little did I realise that nothing in this world is that simple, and owning a tropical fish tank is a mixture of gardening, microbiology and chemistry. Being well aware from my long experience with the eRodents that it's a lot better to learn from the mistakes of others than make them yourself, I decided to do a little reading before I started. 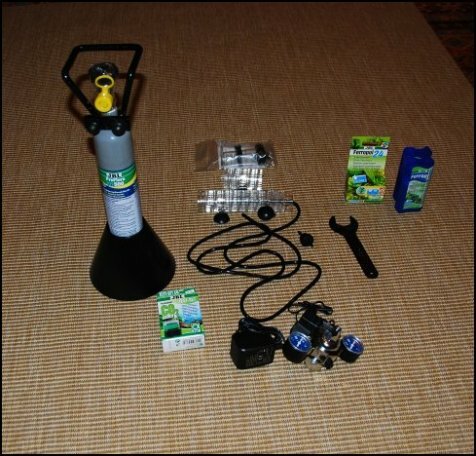 I started out with a copy of Setting up a Tropical Aquarium Week by Week by Stuart Thraves and joined the Tropical Fish Forums UK in order to ask questions. Much reading later I had discovered that the larger the tank the easier it is to get it well balanced for healthy fish and that tropical fish tanks need to be set up initially without fish and then a 'fishless cycle' run to get the filter working correctly to keep the water healthy for fish. I had also decided that planted tanks also look really beautiful compared to ones with artificial ornaments and plants. I was won over by the pictures on the Planted Tank and Rate my Tank web sites. Sadly neon tetras are actually quite sensitive fish and many thousands are imported every year simply to die within a few weeks or months. So out with the two foot tank, the ironic ruined castle and even the neon tetras and in with something all together more interesting. . .
Before the start - Choosing the kit. The tank decision was made fairly easily. 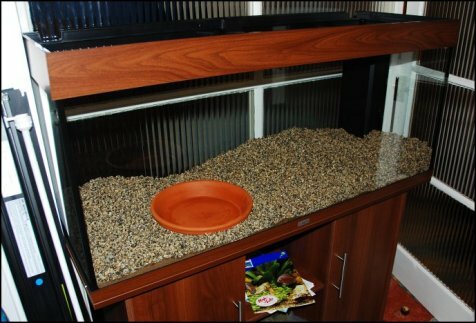 I soon worked out that the larger, the better and I have just enough space for a 4 foot tank. Both the guy in the aquarium store and the people on the tropical fish forums recommended Juwel tanks and the new ones have the new, bright T5 lights which are apparently good for plants. This left me with a choice between the Rio which is a standard rectangle tank and the Visions which have bow fronts. Although the Visions look nice they are quite a bit more expensive for a similar sized tank. It's apparently also difficult to take pictures through the glass, which I would want to do. So decision made - a Juwel Rio 240 it is. I also want a CO2 fertiliser; basically a way of increasing the carbon dioxide in the water during the day, which encourages healthy plant growth and discourages algae overgrowth. I also discovered whilst trawling around pretty much every aquarium store in my local area that the shop assistants generally ignore you - which is actually quite irritating if you need advice and to be sold a tank. Once I was more confident I would just collar an assistant and they were all quite helpful. I can highly recommend looking at all of your local shops, particularly at how the fish are cared for. There is a huge difference locally - in some the tanks are sparkling clean with really healthy looking fish, but others really aren't so good (downright depressing in some). I worry a little about the ethics of the huge numbers of fish that are imported - many of which must die fairly quickly. So I may even try to source my fish from local enthusiasts whose fish have bred and are looking for homes; but we will have to see how practical that is. 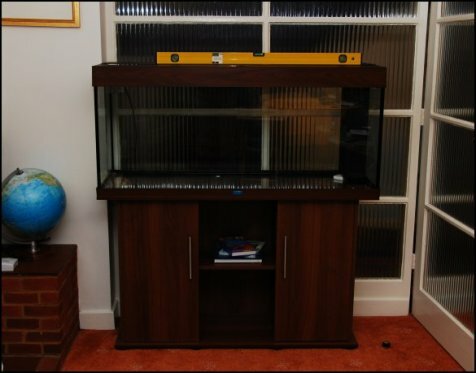 I did have a look at eBay and there were some great bargains to be had, but really wanted a dark wood stand and neither of our cars are big enough to pick up a fish tank. 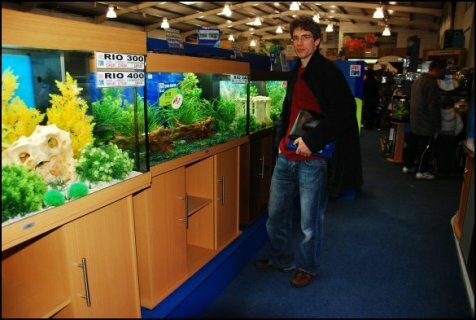 I also didn't feel confident enough to cope with any problems with a second hand tank or to move someone else's fish. 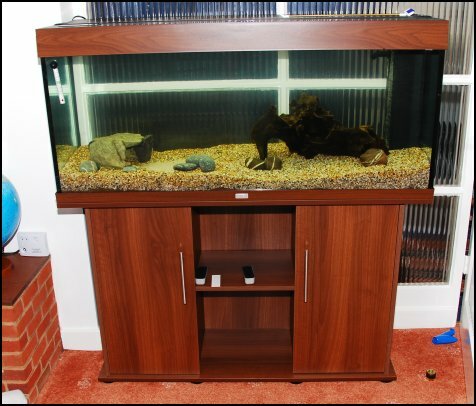 A lot of tanks on eBay don't have fish with them but if you buy a tank that comes with the fish make sure that you have read articles on 'moving house' carefully as it's a real challenge. Anyhow, I'm finally working full time after years of retraining and then being in a part time job, so I decided to splash out some of my hard earned wonga on new kit. I had a budget of �0 for the tank setup (excluding fish) - oh dear that was a bit naive. I was also given 15kg of Aquagrit planting medium, some water conditioner and a net in with the price of the tank. Aquagrit is apparently very good for the plant roots - although I am a little concerned that if I have catfish it might be a bit rough for them to dig around in. But I suspect that 15kg isn't quite enough so I might put some smooth gravel on top. So in the absence of my tank until it has been delivered I am now the proud owner of a bucket of grit and two big pieces of stonkingly expensive wood (although also with a discount). I'm a little concerned about whether I will be able to get all the tannins out of the bog wood - it is currently soaking in a trug of boiling water; apparently it can take a couple of weeks and still stain your water. I hear rumour that you can put it through the dishwasher as long as there are no chemicals in there, but mine has chemicals in some I'm not gong to try it. We shall see. . . Doesn't look that big in the shop does it? You know you're an aquarist when. . . you have a bucket of bog wood soaking in your bath! The first lot of water came off pretty dark and I've read some slightly worrying stuff about aquarium shop bog wood being more trouble than it's worth but I shall give it a go. Current Spend: �4.95 for Juwel Rio 240 with free 15kg Aquagrit, net and water conditioner, � for delivery but with � credit note for fish/plants, � for complete test kit, � bog wood (got a bit carried away there), �15 on receipt for something but not sure what. Well the tank turned up as promised. But I think we may have got a little carried away with the size of it, it's enormous. It currently can only be described as lurking in my hall. It's not actually staying there; it's going to be moved into the living room to be set up. The lurking tank - watch your ankles! I succumbed to a couple of little pleco caves off of a guy on eBay yesterday, I want to put all of my hard landscaping in all at once so as I am not fiddling around with the plants later. I can now see why I bought the two bits of bog wood, I think I may need them (update: actually I didn't). It's still soaking - gave it a good scrub yesterday which increased the tannins leaching a bit but it's going down. I've failed to buy anything else as I couldn't find a gravel I really liked at the shop I went to (well shops but the other had closed in the last week, honest they're going down faster than ants at an aardvark convention). Still unsure about which CO2 system to get and even what fertiliser to use for the plants but I think it can wait. Spend �.50 Total = �7.99 Moneys left: �.01 (like that's gonna stop me). So last night after days of looking at different CO2 systems I completely lost it and bought a JBL Pro flora CO2 Set (M602) for vast quantities of spondoolies. I wanted one that I could set up to turn off automatically at night when I'm away for the weekend as the CO2 should only be run when the lights are on as plants do not use CO2 in the dark as they use it for photosynthesis. Oh and a thermometer - you know it makes sense. Bog wood still soaking and still chucking out tannins. Total Spend = �3.51 Money's left -�3.51 Groveling to husband about to start. Read the instructions thought to the end before you start - obvious but so true. Your really need a ratchet screwdriver kit at the least, if not a power screwdriver as doing it all with a standard screwdriver and the little allen key will drive you mad. Double check that you have the pieces the right way round before screwing them together (again obvious but irritating if you get it wrong). The first job is to attach the sides to the back. For this you need to put the top on its side and the sides need to be held above floor level. To do this rest the sides on two pieces that you haven't used yet to get them at the right level. Don't fully tighten the screws until they are all in. This is particularly important when you put the bottom on. There is no way that you are going to put the tank on top on your own. 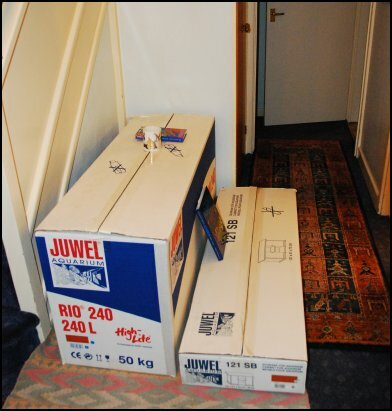 Find a nearby man (or woman) of reasonable strength to help you lift it, two if you can't lift 25kg yourself. The only thing I needed a second person for was to lift the tank on top. Also note the door stop to prevent the glass door hitting the tank. Well it all got a little more expensive as I found a box of Laterite in my local garden centre for �.99, after already having bought some Tetra Complete Substrate. So I decided to use the whole lot - let's hope I'm not over fertilising. Feeling as rough as a badgers rear end on Wednesday I added the substrate. First picture just the Laterite and a terracotta dish; the aim of this is to add a small patch of sand for my corys to dig in so that it doesn't get completely mixed in with the rest of the substrate immediately - I don't hold out a lot of hope though. You can also see my very useful set of step stools and the new buckets which are conveniently marked in litres and gallons on the inside, which is great because it means I can easily measure how much water I'm putting in. I would recommend that you get the type with a pouring lip at the front which helps no end when adding water. Next photo shows the tetra complete substrate and the Aquagrit in. The Tetra Complete looks a bit like soil and the size I had (shown on the steps in the photo above) covered the bottom of the tank with a thin layer which I mixed with the Laterite. You can just about see it at the bottom of the tank - mostly it is hidden under the surround. I rinsed the Laterite as it instructed me to do on the box and a lot of red dust came out, but I didn't want to rinse it completely clean as I was worried about removing all the nutrients. I also rinsed the Aquagrit through. Luckily I own a large sive which fits over the sink, which I'd never been used, that made this job easy. Next I filled the terracotta dish with rinsed aquarium sand and finally put the gravel over the Aquagrit and just over the edges of the dish so that they don't show and broke up the outline with some decorative stones and a fake cave (not shown in the picture). The gravel layer is deeper in places that won't be heavily planted so that the corys don't dig down to the Aquagrit too easily. Interestingly the gravel that I had bought wasn't very dirty and rinsed fairly quickly. I faffed around a bit with the depth of the substrate, I wanted a good deep layer where the larger plants were going but I was concerned that it might be too deep and cause anaerobic bacteria to flourish so I took some of it out again at one point. Finally I added the first 50 litres of water to the tank (not shown yet). To do this I placed a bowel on top of the gravel and poured water carefully in from a bucket so as not to disturb the gravel. I only filled the bucket to 10 litres which meant it wasn't too heavy and also allowed me to add a fairly exact amount of StressCoat and StressZyme to the water. It actually says 10ml for 38l but I added 5ml of each per two 10l buckets as this was an amount that I could accurately measure with the cap. The water didn't go particularly cloudy and it had settled by the next day. It's reasonably easy to tip in a 10 litre bucket from the step stool slowly - I estimate I'm going to need about 20 of them. I'm pleased with my Marina Easy Clean gravel cleaner as it looks like it's high quality, with a good bucket clip which allows you to close off the pipe. It should help no end with getting water out for water changes, but the truth will be when I come to actually use it of course. Spend: Laterite �.99, Terracotta Dish �Total = 758.61 Budget Blown by �8.61 - er can I just point out at this point I'm simply trashing our holiday savings not sticking it all on the credit card. At this point I was struck down with the lurg and everything went a bit on hold. I've just about managed to find the energy today (Friday) to update this website, but nothing else has been done on the tank as I feel faint every time I stand up - it's soooo boring. I have decided that I want Tropica plants which they stock in the Stratford Branch of Maidenhead Aquatics which is a bit of a drive from here (not well enough to drive either - boo). But I've also heard that they stock them at Pets at Home so I will check it out over the weekend if I'm a bit more human. Also good news on the bog wood front - I've taken out the larger piece because I don't have room for both (which is a shame as it's really nice) and the smaller piece is finally starting to turn the water in the bucket less yellow! I'm beginning to look forwards to a time when there won't be a bucket of bog wood in my bath! Now I'm used to it, the tank doesn't look that big, in fact I'm beginning to wonder if it's large enough as I have lots of fish I want and don't want to stock that heavily. Ho Hum. 6 x Harlequin Rasbora 1.6" = approx 10"
1 or 2 Bristlenosed Catfish 5" = 10"
Not all put in at once of course - I've got to cycle the thing first. At some point in the future when everything is well established I'd also like a pair of the smaller Cichlids, but that will have to wait a long while. I think I need to lie down now, I'm feeling distinctly rubbish after that (the lifting buckets of water not the working out which fish I'd like). Limnobium laevigatum - a small surface floater. I've chosen them as being listed as easy plants with a wide range of conditions tolerated. I have to admit that the Thraves book uses a lot of them for his example tank setup, but I want my tank to look good, not original. I'm going for all green as I think the fish will show up better and it will look more natural. This is the site for the : Tropica Catalogue. I did, however get to wander around the fish at Maidenhead aquatics again. I'm going off the idea of neon/cardinal tetra and think I might go for some glowlight and X-ray tetra which seem a little hardier and are very attractive in a more subtle way.The filter and heater have been running over night and it's all cleared nicely. The glass is a little dirty from the water splashes and the top of previous levels, so I've bought a magnetic scraper, I would advise doing all of the filling at once if possible to avoid this. The good news is that the water is only slightly yellow from the bog wood. So I've now cleaned up the glass with the magnetic thingy which is really great (Mag-Clean medium) but watch your fingers those are really mean magnets! I couldn't use it to do the back due to lack of access so I used the scraper on a stick I bought yesterday. I think I may have to tell people that it's special invisible fish and plants as it's going to be a while before they arrive. I've been having a think about maturing the filter having talked to many people about it. I really don't like the idea of buying ammonia from a DIY shop as you just don't know what it's contaminated with, so although everyone says it's just expensive ammonia I'm going to buy some Waterlife Biomature as it's designed for the purpose and I won't be accidentally introducing industrial chemicals into my tank. Probably less necessary is that I've bought their 'bacterial' product Bacterlife as well. There's a lot of cynicism out there about the bacterial products but it's only a couple of quid. I've also bought a carbonate hardness test. Another 20 squiddlies bites the dust with the rather excessive postage cost.As you can see from the photo I've got the cable tidy on so that you can hardly see the cables either from the front or through the glass wall at the back. However you can see into the back of the cabinet which looks rubbish so I'm going to sort out a dark cardboard back for them. Maturing Filter and KH test = � Total Spend = about 900 squiddlies Over Budget by 400 squiddlies. 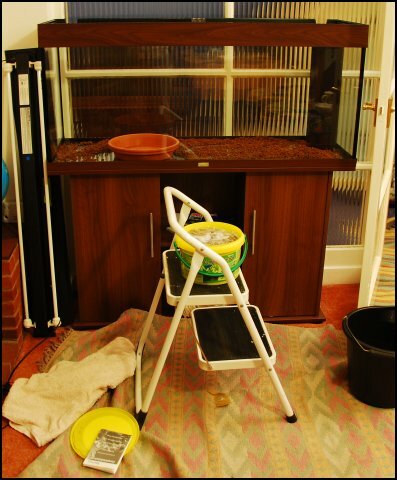 This is pretty much the final figure for setting up the tank (minus fish) - it is a lot of money and it might look like I've been just chucking it away, but you do make the odd mistake when doing a project like this. What would I not have bought if I did it again? Well some of the chemicals were a bit overpriced, I haven't used one expensive piece of bog wood and some of the substrate (the tetra complete) was surplus to requirements but that probably doesn't add up to more than about 50 quid. To follow the next, slightly more exciting, phase of the process go to the Planting the Aquarium page.